This is Eldorado Stone's York Limestone. It's Eldorado Stone's York Limestone cast stone. Is this a blend of Eldorado's York Limestone or the stock product? - I love the larger blocks mixed throughout but it is hard to tell from Eldorado's product page if that is standard. This is the stock product. Beautiful residence, love the paint and stain colors! - Can you tell us the brand/name of the main body house color, and the stain color or a paint color equivalent? Thanks so much, such gorgeous details everywhere! 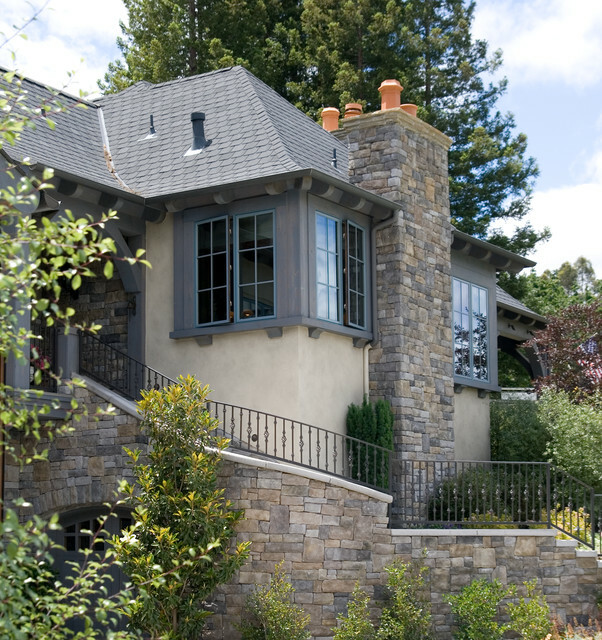 We like this Eldorado "York Limestone"
What I like about this is again the rustic style of stucco and then the window trim is a dark contrasting color which really makes you focus on the windows. I can totally see your cabin with some really contrasting window trim, or better yet some rustic wood trim. Even the LP Smartside trim which is the same as my board adn batten is just treated and more stable wood and definitely much more easy on the budget.